We're going to let you in on a little secret! Creating perfect, diner-style, sunny side up eggs is actually really easy. There's no mess involved and the results are delicious. 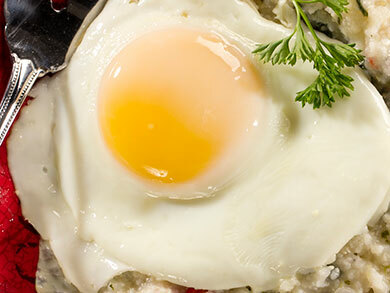 All you need is a pan, an egg (or maybe a few, depending on how hungry you are! ), and a stove. Before you know it, you'll be serving up delicious breakfast favorites to your family in no time. They may never want to go out for a diner breakfast again! Check out our video and tips on how to fry an egg. It's so easy, you'll want to add fried eggs to every meal! If frying an egg seems pretty easy, it's 'cause it is! In fact, you might be surprised to learn that you don't even need any oil to fry your eggs. Yep, frying an egg is all about the steam! 1. Melt a little bit of butter in a hot pan. You want the pan hot, but not hot enough to burn your butter. 2. Crack your egg(s) into the pan. Reduce heat to Medium/Low. You want your eggs to lightly cook, and not too quickly. 3. Cover your pan. The eggs will actually fry up with the steam inside the pan. To speed up the process you can add a drop of water before covering. 4. Check for doneness. The translucent part of the egg should turn white. The yellow should slightly thicken. Now that you know how to fry eggs, you can easily make over easy or over hard eggs. When you see the word "over" it means that the egg has been flipped "over" so that the other side gets cooked too. Make sure you follow the steps listed for how to make sunny side up eggs before moving on to the first step. 1. Carefully flip your egg over with a spatula. Egg should now be yolk-side down. 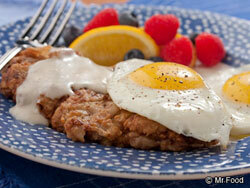 *You can add additional cooking time to your second side to make your fried eggs over-medium or over-hard. The difference between them is how much the yolk is cooked. 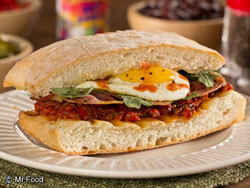 Practice your new egg-frying skills with these tasty recipes!